So for instance, a rigid connection between two members (i.e. any forces or moments are transferred from one member to the next) will be denoted as ‘FFFFFF’ whereas a hinge connection (which which cannot transfer moments in the Z direction) would be coded as ‘FFFFFR’. “Frames” have a fully fixed, rigid connection specified by a fixity code of ‘FFFFFF’. “Trusses” have a hinged connection denoted by a code of ‘FFFFFR’. To specify custom values, ensure that the “Custom” button is selected. For more information on member fixities, SkyCiv has a technical article (including a video) in our blog, focussing on how to model member fixities. In this example we will create a simple pin connection, such as a hinge. Start by creating 3 nodes and joining them with 2 members. In this example node 2 will be the hinge. Select member 1 to bring up the menu for it’s settings. 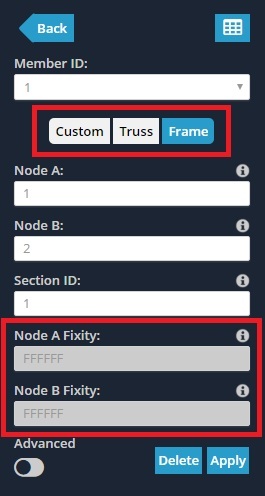 Click the “Custom” option to allow you to edit the fixity values. We want the hinge to be at node 2, which for member 1 is the “Node B” end of the member. This means we need to edit the “Node B Fixity”. 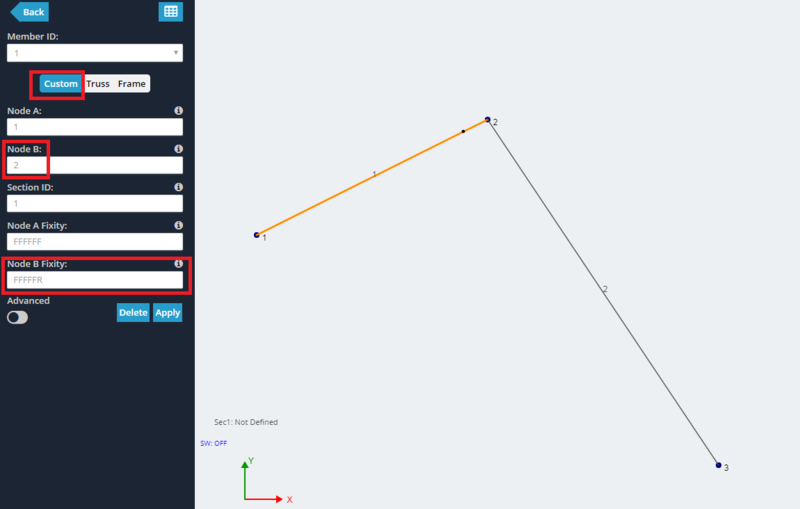 Since we want the hinge to be able to rotate about the Z axis, we set the Z rotational fixity (the 6th value) from F to R.
Select member 2 to bring up its menu. Click the “Custom” buttom as previous. Note that node 2 is the “Node A” end of this member. This means we need to change the “Node A Fixity”. As before, change the Z rotational fixity value from F to R.
The hinge that rotates about the Z axis is now complete. Notice that a dot appears at the end of the member that has a rotation release. 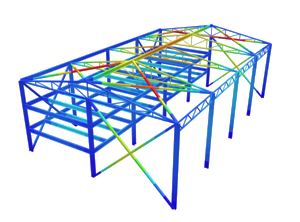 For more information, SkyCiv has a further explanation on how to model a hinge, using Structural Analysis Software.